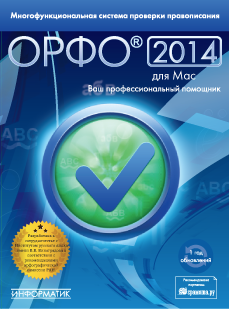 ORFO 2014 for Mac- Proofing service, Russian grammar, spelling, English and Ukrainian languages ​​for users of OS X. Works in accordance with the operating system software provided by the interface and is available in all applications that support the "Spelling". In addition, supports spell checking in MS Office package 2008/2011 and in MS Outlook 2011 has grammar checking and style. Explanatory dictionary of modern Russian, Explanatory dictionary by V.Dahl, Russian synonyms, antonyms, Russian, Russian paronyms, Etymological, Explanatory Dictionary of Russian language and Dictionary of foreign words in Russian. The cost of the first year of updates dictionaries and templates of grammar check already included in the cost of the license. 1. Mac computer with Intel ™ processor an i386 or x64 architecture. 2. Operating System Snow Leopard (version 10.6.6 or later), Lion or MountainLion. 3. 100 Mb of free disk space.